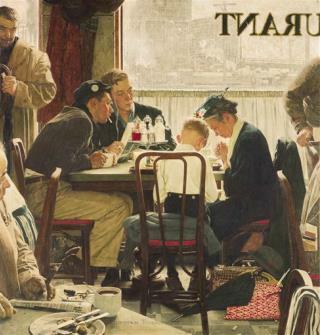 (Newser) – A Norman Rockwell painting titled "Saying Grace" sold at an auction yesterday for $46 million, a record for the Saturday Evening Post illustrator and for any work sold at an American art auction, Sotheby's said. Two people on the telephone bid against each other for nine minutes before the hammer came down, with the winner's identity kept a secret. The painting, which was voted Post readers' favorite cover in a 1955 poll, had a pre-sale estimate of $15 million to $20 million—well above the $3,500 Rockwell was originally paid for it. Years back I bought a used book on Norman Rockwell's prints; it had a collection of his best works and even included "Saying Grace". Guess I need to find it somewhere in my library, dust it off and look at the prints again. I recall the book cost me $25, but $46M is absolutely outrageous. It's sad when rich folks have nothing better to do than to throw their money away on things like this. Sure a lot better quality of a painting than most of that crazy Van Gogh junk,or Jackson Pollock crap too.